Prior to the early 1990s, there was no cure for macular holes. Different attempts were made to try to repair such holes surgically, with limited success. In the early 1990s, however it was discovered that if the vitreous gel were removed surgically from the eye and the vitreous cavity was filled with a temporary gas bubble, the hole would seal itself, resulting in visual improvement. This requires face-down positioning to allow the gas bubble to press against the hole to help it close. As we have improved techniques of hole closure during the last 10 years, face-down positioning time has been decreased, and the rate of hole closure has improved to 90 percent or greater. As with any surgery, there are surgical risks. These risks include cataract formation, retinal tears and detachment, failure of hole closure and infection or bleeding in the eye. With these relatively low risks, many patients elect to proceed with surgery with a realistic expectation of better vision when the repair is performed in a timely fashion. Macular hole surgery is done as an outpatient procedure and usually can be performed in one hour or less. The gas bubble that results from the surgery is slowly reabsorbed into the bloodstream over a period of 2 to 8 weeks, depending on the concentration of gas that is used by the surgeon. The eye refills itself with a watery fluid as the gas bubble is reabsorbed. 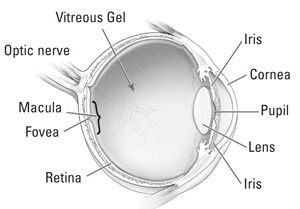 The eye does not make more vitreous gel. 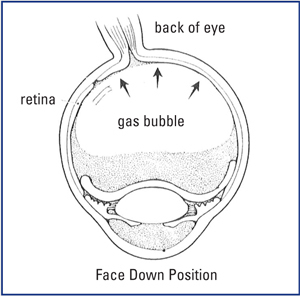 While the gas bubble is in the eye, the patient may not travel by air or inhale nitrous oxide (commonly used by dentists—“laughing gas”) as either of these activities will cause the gas in the eye to expand, often leading to pain and possible blindness. To assist patients with the face-down positioning, there are positioning aids that may be rented from specialty companies. Ask your doctor for this contact information. 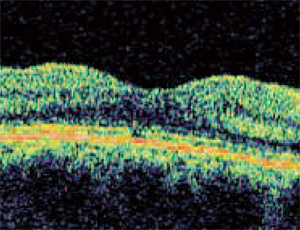 The most common side effect of macular hole repair is cataract formation that often requires surgery within 6 months of the macular hole repair. Please discuss this and other implications of surgery with your physician. How frequently does cataract formation occur? If you have not had cataract surgery, you will likely develop a cataract and may need surgery in the next 6 to 12 months. 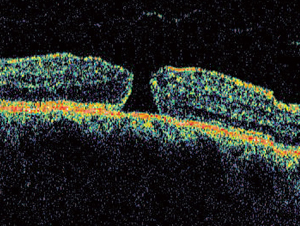 How often does retinal detachment occur? 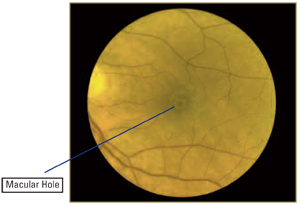 Retinal detachment occurs in 1 to 2 percent of patients and is usually repairable. How long will I need to assume the face-down position? In general, rigorous face-down positioning is encouraged for 7 to 10 days. What happens to the gas bubble and how long will it last? The gas bubble will slowly be absorbed by the body. It may persist in the vitreous space for as long as eight weeks. Generally, you should not fly until the bubble is completely gone. Your doctor may allow you to travel by air sooner if it is safe to do so.